It was a busy and productive weekend here at the zoo. Mom and Dad arrived Wednesday evening in Dad’s car, which decided somewhere around Breezewood that heat was a luxury, and they didn’t really need it. Hyon and Drew and Clint came over to see them, since they haven’t seen him since he was about 6 weeks old (we think). We went out to dinner with John and my folks, and then we all called it an early night, since Dad had worked Tuesday night, and Kris and John had to be up early so John could get to the airport. It’s kind of odd to think that he isn’t coming back this time. I’m so happy for him that he can finally be home with his family, but we are going to miss him. Thursday was the typical Thanksgiving – I cooked, Mom got yelled at for trying to clean up, and Kris sat outside babysitting the turkey in the vat-o-oil. We brined the turkey this year, which was new. It worked quite nicely, I think. Next time, I might brine it longer (like overnight, instead of just 4 hours), and I think I will rinse the brine off the bird before we fry. The skin got really dark, but that may have been a combination of the honey in the brine and the oil having been used before. Friday morning we got up and went to breakfast. Then Dad and Kris went bowling, while Mom and I watched. I think they really had a lot of fun together. They had to head home around 2:00 so Dad could get to work Friday night, so it was a short weekend. Thursday night, Julian and Betsy had called to say that they were coming through Bowie on Friday on the way back to Florida, so they stopped here and we had dinner and hung out for a while. It was really awesome to see them. We miss them. Of course, Betsy is now trying to convince us to move to Florida so she and I can open a yarn store. After J and Betsy hit the road, Saturday was pretty quiet around here, which was nice. 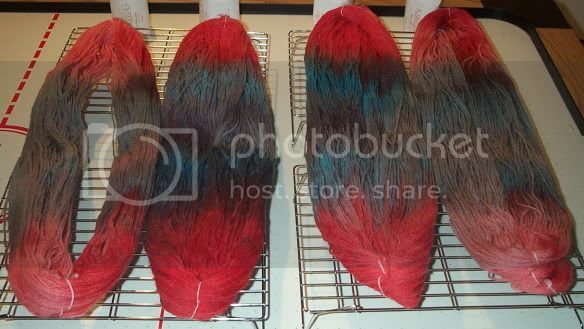 Sunday, Kris had another World of Warcraft LAN party, so I hid in the kitchen and played with Kool-Aid, working on the yarn for Nora’s purse (the commissioned piece I mentioned before). I also got a fair amount of knitting done through the weekend. I finished Jessica’s purse last week. I’m happy with how it came out – it actually looks like I planned it to look. The miracles of swatching and measuring! The inside suffered from an over-abundance of Fun Fur, so I trimmed off the fuzz once it was felted. The handles (It’s hard to see in this picture, but there are two, honest) are each two icords that I twisted together after felting and let dry that way, so they seem to be holding their shape nicely. The purse is about 10″ across the top opening, and about 8″ across the base. I felted (OK, fulled, technically) it for longer than I have with the other bags I have done, so it’s pretty firm and stands up on its own. 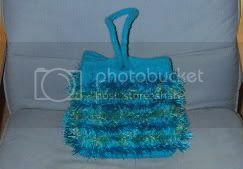 Janelle’s purse was completed while Julian and Betsy were here, and it went in the washer on Saturday. Closed on the left, and open on the right, obviously. The base didn’t come out quite as square as I had hoped, but it’s very close, and I think it still looks pretty darn cute. The icord handle pulls through an opening on the front of the purse to close it. There was a woman in Stitch DC one day who had something like this (only smaller), and I used her purse as a jumping-off point for this one. 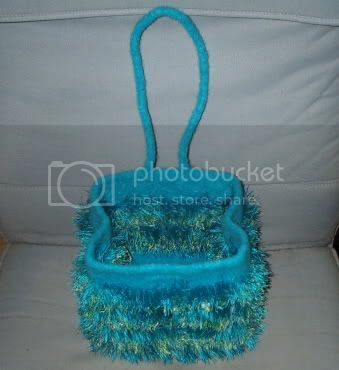 I also have some pretty green Cascade 220 that I picked up the weekend before Thanksgiving with the intention of making a Fun Fur-free version of Janelle’s bag for myself at some point. 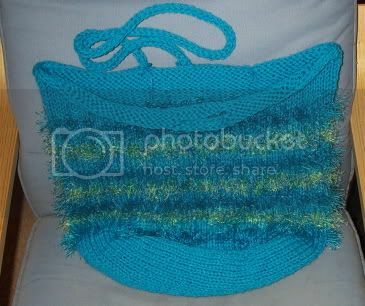 I may eventually write up the patterns for both of these bags, once I have time to sit down and do it. I took pretty good notes, so I should be able to recreate them. I finished two more squares on the afghan for Kris’s grandmother – 3 down, 9 to go. All of them were dyed together, but for some reason, the ones in the center took the blue Kool-Aid much better. I’ll save those for the actual bag, and use the other two to start the swatching process. From left to right, that is Tropical Punch, Berry Blue, Grape, Ice Blue Raspberry Lemonade, and Cherry Kool-Aid. So, the plan for today is to wind the dyed yarn (which is now dry – yay), and start swatching it and figuring numbers for the purse. I also want to get started on Kris’s gift. As soon as I have Nora’s bag done, I’ll start on Dad’s Satchel. And theoretically, I’ll get this all done by Christmas. I hope. And just for fun, I decided to see what Simba would look like in my Clapotis. He was incredibly patient and stayed put while I got the camera. 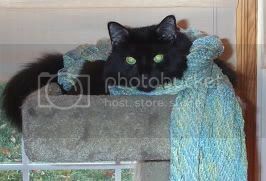 November 28th, 2005 | Tags: Beasts, Family, FOs, Knitting, WIPs | Category: Misc. The bags look great! 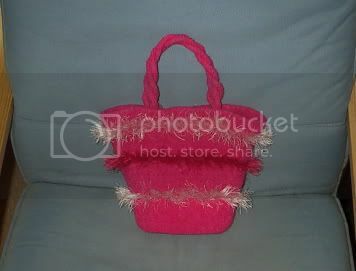 As I have mentioned, if you get the chance to pull together the patterns, I will probably try out the pink bag–how can anyone resist such cuteness? i love the bags too.